Binn idir an dà Log is the highest of the Maamturks, and is an impressive mountain amongst impressive mountains. Its name, meaning ‘peak between the two hollows’ aptly describes its physical appearance as it has corries to the east and south, with ridges leading to the summit from the north and south. The upper few hundred metres of the mountain is pure quartzite, so good footwear is needed to walk on the shattered stone and to follow the sandy trails carved out by countless boots. 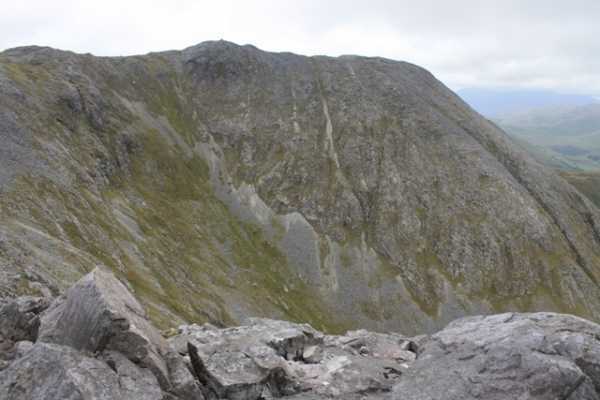 One approach from the south, via Binn Chaonaigh, is to start from the car park at L893 495 A. Follow the good track up to the col between Binn Mhòr and Binn Chaonaigh, known as Maumeen, where there is a Chapel and Holy Well at 250 metres. Turn left to climb 400 metres up to Binn Chaonaigh over initial steep grassy slopes and then shattered rock. From Binn Chaonaigh there is a ridge leading first to Binn idir an dà Log SE Top, and then on to the main Binn idir summit. This route involves about 700 metres ascent total, over about 5 kms distance, and requires care as some sections are steep. From the north, an option is to park at L878 557 B, where a track heads off the road. Follow the track south to approx L880 541 C and climb up steep grassy slopes to Maumahoge at L877 537 D. Follow a steep rocky ridge above the lake north for about 1.5kms to the summit.